Over the holidays, I had a chance to reflect and consider my future. I found myself unsatisfied with my daily work. Somewhat serendipitously, I stumbled across a TED Talk from philosopher Ruth Chang. Chang helped me decide to leave Microsoft and take a job at Amazon. I start on Monday, January 25. Dr. Chang’s research focuses on the nature of hard choices. She argues that hard choices are hard because we tend to try to resolve them by using quantitative techniques. For example, adding up all the pros and cons of each choice theoretically should indicate the superior choice. But it doesn’t, in practice, because human experience is not quantitative. Instead, Chang tells us, we should see competing choices as “on par” or “in the same neighborhood” as each other. From there, how do you decide? Chang urges us, in all existentialist glory, to embrace a choice for what it represents. Choose a job that declares who you are, she says. Move to the country because you declare you are “for the country.” Make a decision that symbolizes the self you want to be. And embrace that hard choice! So I have done exactly that. I am choosing to be urban (Amazon is a 40-minute walk from my home). I’m choosing to be a little bit chaotic. I’m choosing crazy unknowns (I have no idea what I’ll be working on). I’m choosing to jump with both feet. I was not unhappy at Microsoft; I just wasn’t growing. So above all, I am declaring myself in favor of growth. I am choosing new. Qualitative research is not generally considered “real” research, and this has terrible implications for innovation. Companies’ thirst for operational effectiveness begs for quantitative data. But quantitative data does not and cannot form strategy. Qual data are a key ingredient to strategy, or the development of new and differentiated products. Many people are familiar with Michael Porter’s famous paper, “What is strategy?” Porter famously argued that many companies mistake operational effectiveness for corporate strategy. Operational effectiveness, according to Porter, is about quality, productivity, and speed. It is about doing the same thing as others, but doing it better. 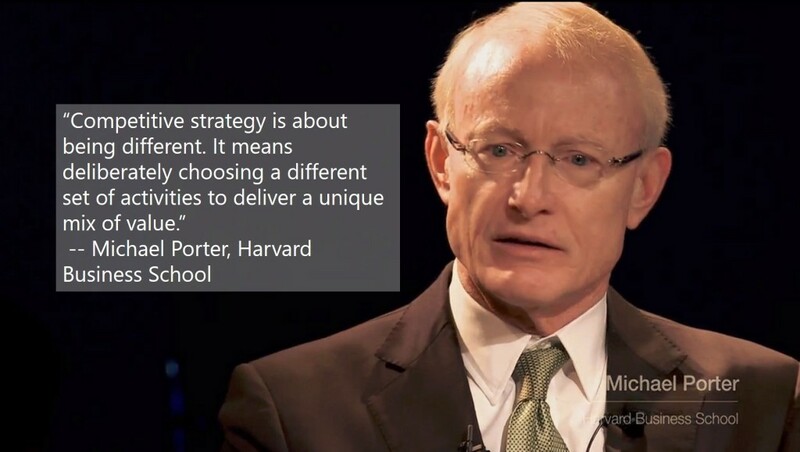 Strategy, by contrast, is about being different. It is about doing entirely different activities to deliver value to customers. Other authors have called this the “blue ocean” or finding a place in the market that is calm, unoccupied, and yours for the taking. A “red ocean” is full of competitors, doing exactly the same thing as you are, and demanding ever higher performance. Framed this way, it is clear that operational effectiveness relies heavily on quantitative data. How efficient are we? How do we stack up against the competition? How good are our products? How fast do we make them? Operational effectiveness simply begs for quantitative data, and now that we have access to petabytes of passively collected data relating to productivity, quality, and speed, it is easier than ever to be operationally effective. Or it should be. We know that quantitative data requires a great deal of cleaning, massaging, and managing, not to mention analysis, to make it useful for operational effectiveness. The shift to data-driven operations has demanded a great deal of companies’ attention, mostly because data collection and analysis is not as easy as most think it to be. But let us not mistake this for strategy. There is nothing inherent to benchmarking performance that lends itself to strategic advantage. Quantitative data does not reveal how or in what ways customers are making their own workarounds. Quantitative data shows us how many products meet a particular standard, how many products are produced or sold, or how fast a company makes them. It can tell you the average satisfaction a customer may have, but it cannot reveal any of the detail behind that satisfaction. In their insightful Harvard Business Review article, “An Anthropologist Walks Into A Bar,” Christian Madsbjerg and Mikkel Rasmussen argue that qualitative research gives companies the ability to bridge the “complexity gap,” or what a study of 1500 CEOs revealed as their main challenge. Why do customers do what they do? You must do qualitative research to find out. And, by extension, you must do qualitative research to innovate. 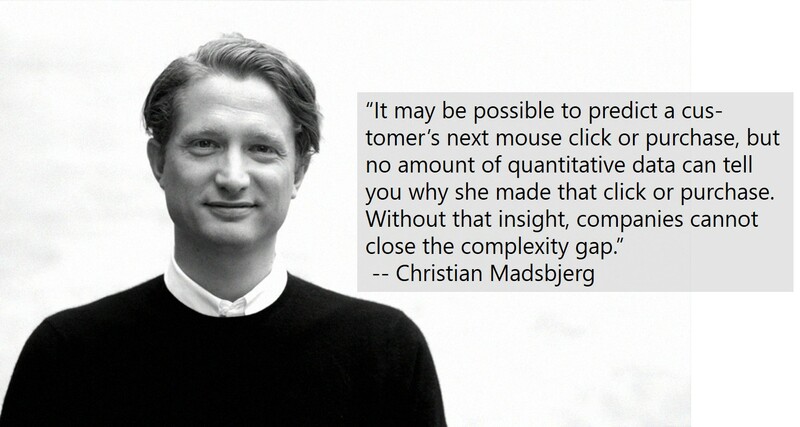 Qualitative research is explicitly about revealing detail. Qualitative research shows how people are using products, or how these products sit and gather dust in the corner of the kitchen. Qualitative research, particularly field-based research like ethnography, offers that path to delivering truly different products. Companies that do ethnography regularly uncover entirely new or different ways to deliver value to customers. Oftentimes, this is done unsystematically. Skillful product and brand managers know that observing everyday life can reveal the how and the why of product failure. Nike is a great example of a company that is in touch with culture. Its marketers are largely acknowledged to be among the best in the world. Its product innovation is continual, and its brand equity is unparalleled. Even their lab-based researchers like the fabulously named Gordon Valiant are active members of the running community. His lab-based practice is complemented by regular participation in running events, where he comes into contact with other runners. Valiant conducts in-lab studies systematically, but observes human behavior in an ad hoc way. Imagine the advantage to companies that do this research systematically. Imagine having a steady stream of insight into real people and why they do what they do. Imagine having thick description of painful workaround work, and regular replenishment of unmet customer needs. That can only come from systematic, regular, and rigorous qualitative research. Compare that to a company tirelessly benchmarks its quality, productivity, and speed. The company with qualitative insight into human behavior will have almost limitless potential to do things differently, to deliver new products or services, to find entirely unexamined oceans of product innovations. Yet we spend almost nothing on qualitative research. Esomar, the international market research association, estimates that in 2013, corporations spent $6.6B USD on qualitative research, worldwide. The vast majority of money spent on qualitative research is on focus groups, but Esomar estimates almost $1.6B is spent on the more interpretive methods of in-depth interviewing and ethnography. This amount is dwarfed by the $32.4B USD spent on quantitative market research. It could be argued that many companies need to start with operational effectiveness. Fair enough. But no company can survive on quality, productivity, and speed alone. It is too competitive a marketplace. Qualitative research, therefore, is a cheap way to guide the company toward different product offerings, and ultimately, toward innovation. Update December 23, 2017: New findings from an AI-based experiment on gender and performance reviews has been added, and a new evidence-based improvement strategy called the “small wins” model. The evidence is mounting that our existing feedback systems have inherent biases that penalize women. I have a personal commitment to help improve this, and in this post, I make specific recommendations on how to do so. But first, what do we know about gender and performance reviews? Women receive more criticisms of their personalities in performance reviews: A linguist did study on performance reviews. Men and women provided positive performance reviews. She found that in 83 performance reviews, men received personality feedback in only 2 cases. In 94 critical reviews, women received personality criticisms 71 times. Words like “abrasive” and “strident” were present in these performance reviews. Men reward other men more highly than women for achieving the same goals: 70% of men rate men more highly for achieving the same goals as women, while an algorithm rate men and women equally (as did other women). The “glass ceiling” is the result of many tiny obstacles. Researchers at Harvard Business School found that there is no specific point where women face a “ceiling,” but many small instances of discrimination lead to their careers stalling over time. This may be why after only 2 years with a company, women’s aspirations for career advancement fall an astounding 60%, while men’s aspirations fall negligibly. Women pay a penalty for motherhood, while men reap a bonus for fatherhood: Researchers have found women who become mothers pay a minimum penalty of 4% decline in income. The penalty is larger for more educated women. By contrast, fathers reap a bonus . This is not due to a lack of commitment by women, by biased perceptions of their commitment. In other words, the cost of being a parent depends on your gender, not your performance. Men are penalized when they ask for family accommodation. In a study of a management consultancy, one researcher found that men who ask for flexibility to care for their families are punished in performance reviews. Men who did not openly ask but made private, covert arrangements got better performance reviews. Just pointing out bias actually increases its incidence! Other research has found that pointing out bias actually increases its negative consequences. This effect disappeared when researchers noted that discrimination is not desirable. Examine the words you use in your performance feedback. Is it related to personality or performance? Are the words very gendered, such as “bossy”? Consider what words you might have used to describe the opposite gender. Is your feedback helpful and specific? Did you provide vague praise like “Great job this year” or did you say, “Your work on the launch plan led to greater sales”? Make sure you link the feedback to specific business goals. Did you reward fairly? Is there a systematic difference between the genders? Could this be unconscious bias? Is this a “tiny obstacle”? How many barriers has your direct report experienced in her career? Is this performance review a chance to create a “tiny ladder” through the glass ceiling? Do you expect women to be more altruistic? Reward men and women equally for the same behaviors. Consider if you expect women to be more giving of their time than men. Do you expect men to be less family-oriented? Recognize that men have families too. Are you penalizing a man for being a caring father? Is your direct report asking for something…and are you evaluating that ask fairly? Consider what kinds of requests your direct report has made. Are you judging those requests fairly, or are you penalizing the person for speaking up? Unconscious bias is wrong. Make sure you point out that bias is wrong, not just that it exists. Norms are powerful, especially for senior leaders. K. Snyder, “The Abrasiveness Trap: High Achieving Men and Women Are Described Differently in Reviews,” Fortune, New York, Aug-2014. S. Correll and C. Simard, “Vague Feedback Is Holding Women Back,” Harvard Business Review, no. April, 2016. A. Grant, “Rocking the Boat but Keeping It Steady: The Role of Emotion Regulation in Employee Voice,” Academy of Management Journal, vol. 56, no. 6, 2013. A. Eagly and L. Carli, “Women and the labyrinth of leadership,” Harvard Business Review, no. September, pp. 62–71, 2007. E. J. Castilla and S. Benard, “The Paradox of Meritocracy in Organizations,” Administrative Science Quarterly, vol. 55, no. 4, pp. 543–576, Dec. 2010. L. MacNell, A. Driscoll, and A. N. Hunt, “What’s in a Name: Exposing Gender Bias in Student Ratings of Teaching,” Innovative Higher Education, vol. 40, no. 4, pp. 291–303, 2015. H. R. Bowles, L. Babcock, and L. Lai, “Social incentives for gender differences in the propensity to initiate negotiations: Sometimes it does hurt to ask,” Organizational Behavior and Human Decision Processes, vol. 103, no. 1, pp. 84–103, May 2007. M. Heilman and J. Chen, “Same Behavior, Different Consequences: Reactions to Men’s and Women’s Altruistic Citizenship Behavior,” Journal of Applied Psychology, vol. 90, no. 3, pp. 431–441, 2005. T. Street, A. Arbor, and P. O. Box, “Has the Price of Motherhood Declined Over Time ? A Cross-Cohort Comparison of the Motherhood Wage Penalty,” Journal of Marriage and Family, vol. 65, no. August, pp. 597–607, 2003. J. a. Kmec, “Are motherhood penalties and fatherhood bonuses warranted? Comparing pro-work behaviors and conditions of mothers, fathers, and non-parents,” Social Science Research, vol. 40, no. 2, pp. 444–459, Mar. 2011. G. Hundley, “Male/Female Earnings Differences in Self-Employment: The Effects of Marriage, Children, and The Household Division of Labor,” Labor Relations Review, pp. 95–114, 2000. E. Reid, “Embracing, Passing, Revealing, and the Ideal Worker Image: How People Navigate Expected and Experienced Professional Identities,” Organization Science, vol. 0, no. 0, p. null. M. Duguid and M. Thomas-Hunt, “Condoning Stereotyping? : How Awareness of Stereotyping Prevalence Impacts Expression of Stereotypes,” Journal of Applied Psychology, no. October, 2014. E. L. Kelly, P. Moen, J. M. Oakes, W. Fan, C. Okechukwu, K. D. Davis, L. B. Hammer, E. E. Kossek, R. B. King, G. C. Hanson, F. Mierzwa, and L. M. Casper, “Changing Work and Work-Family Conflict: Evidence from the Work, Family, and Health Network,” American Sociological Review, vol. 79, no. 3, pp. 485–516, May 2014.